May 24, 2017 - We got the following emails (consolidated) and photo from David. This has also been included in our Technical Section/Trailers. It is with great sadness that I report the loss of Dolphin, Yankee #193. We were driving her to the lake to launch her for the year when the trailer started to oscillate, pulling us into the ditch. 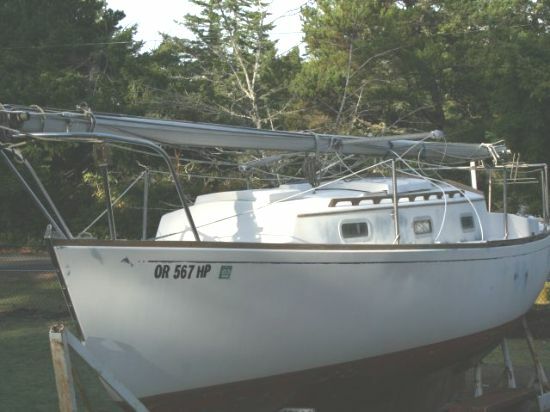 She flew from the trailer, landing in a field 20 feet from the trailer, with a 3-foot crack in her hull below the waterline, a broken rudder, and splinteredcabinetry. We were going at fairly low speed (~35mph) on a straight, flat, but slightly rutted highway when it suddenly started swinging in rapidly increasing oscillations. One of the guys here who moves boats professionally said that that can be a sign of insufficient tongue weight, but it was good when we left home. We live at the bottom of a very steep hill, and it's *possible* that something shifted going up, but we'll never know. The tongue of the trailer was sheered off and still connected to the hitch by the time everything came to a halt. She will never sail again, and we are devastated, but at least my son and I were unhurt. March 2. 2009. David checked in today to announce his purchase of # 193 from an owner in Florence, OR. She has been out of the water for several years. 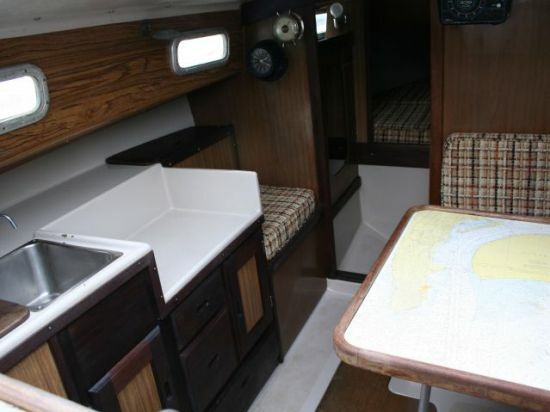 We first found out about this boat when someone told us she was for sale on NWadpage.com. That ad is below. The pictures came from the listing will start with them. David's email is below. We live in Eugene, Oregon, and we picked up #193 from a Craigslist posting last month. 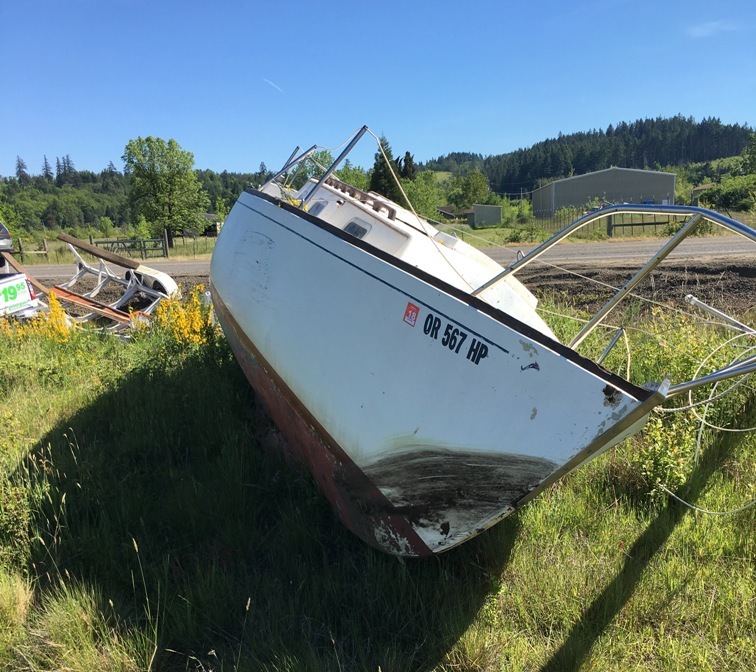 She was in Florence, Oregon, and the previous owner has had her out of the water for several years. I believe he's had her for a long time (~20 years?). 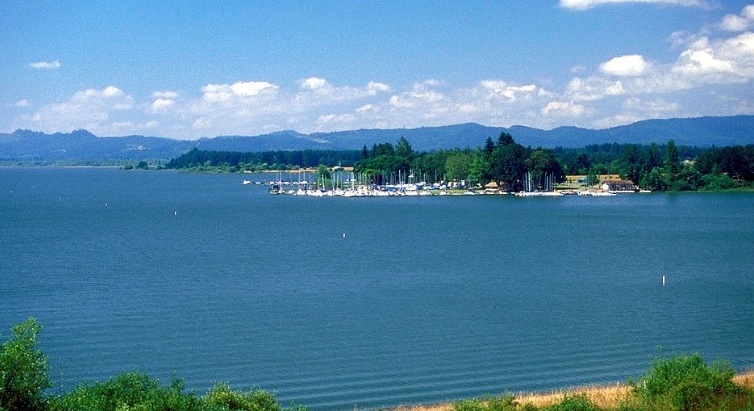 We'll be sailing/mooring her at Fern Ridge reservoir (assuming we can get a slip next week when they come up), at least for this first year. Hope to take her up to the Gulf Islands or the San Juans in the future for some cruising. At this point, I'm trying to figure out what needs to be done. A couple of pieces of the exterior teak are cracked or missing, so I'm working on making replacements for them, and all the exterior teak is in need of sanding and oiling. 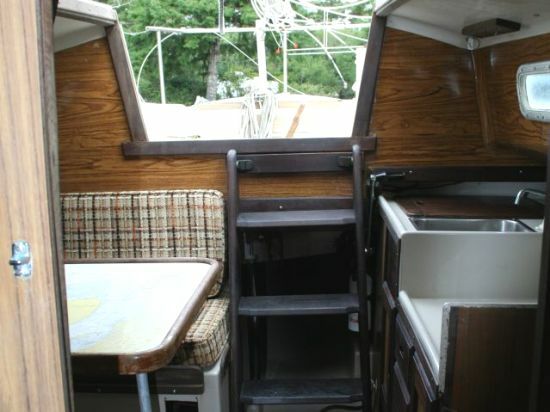 She had some moisture in her, too, so we're drying her out and cleaning mould off some of the cabin drawers etc. There will probably need to be some refinishing there, too. Can't see the centerboard on the trailer, so I'm hoping it doesn't fall into the lake when we launch her. The wiring is disconnected at various places and the fuse panel has no fuses in it, so I'm trying to figure out what's supposed to go where, what rating the panel fuses are supposed to be, etc. One of the connectors that's supposed to connect the mast lights to the electrical system at the base of the mast is broken, so I have to figure out where to find replacements. This is my first foray into marine electrics, so I'm still trying to get my bearings. The motor is a 9.8 or 9.9 electric start Mercury of some sort (haven't been able to figure out the model yet), and I have yet to figure out whether it even works. (The previous owner said "It worked the last time I used it.) There's a blower system in the stern locker that is (presumably) supposed to bring in fresh air and blow out exhaust. No idea if that works, either. The sails (genoa, storm jib, main and spinnaker) all appear to be original. We'll have to wait for it to stop raining here to get a good idea what shape they're really in. We'll send pix once we get her untarped... It's pretty wet at this time of year in Eugene, and we're still trying to get the cabin fully dried out from the condensation. I've been looking around the forums and will continue to do so. Thanks for maintaining such a useful site! February 28, 2013. We are filling in a bit of #193's history. She was once Jeff and Janice Tompkins' Balanceo, Yankee #193, San Diego, California/Medford, Oregon. Click here to go there. At the moment she's on the hard for the winter. 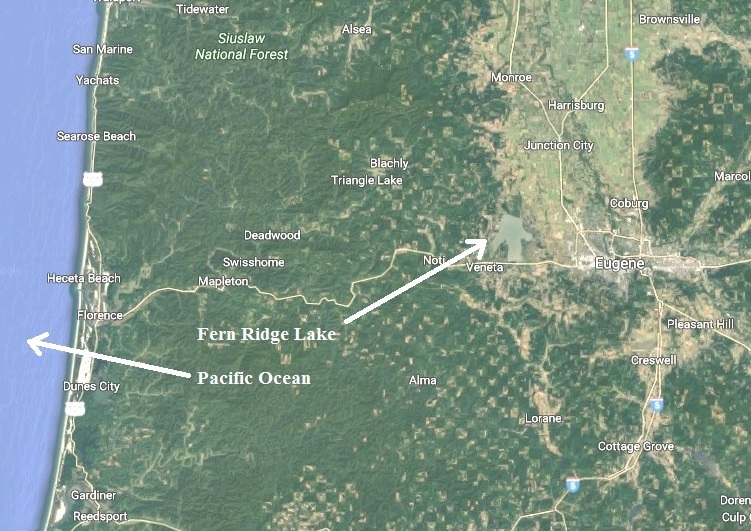 We're trying to figure out where we're taking on water. Suspect it's somewhere in the portside hull-deck joint, since it seems to happen when my son is sailing her, and he likes to wash the windows when the wind picks up. Merry Christmas (or midwinter festival of your choice)!